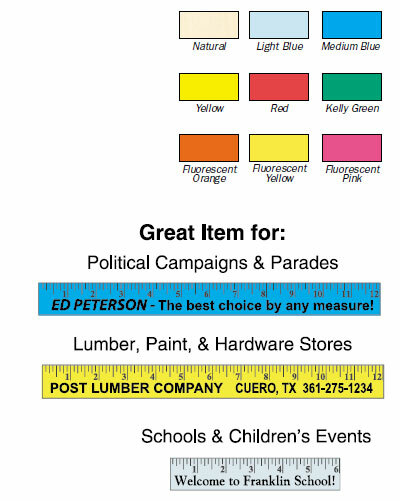 Advertising Rulers | Anthony & Co.
Our popular basswood flat rulers are imprinted with a gauge and advertising in one color. • Scale: For metric gauge (1/2 centimeter) on one side and inch on opposite, add $25.00 (V). • Second Side Imprint: For imprint on second side add $.04 each (U). • Color Change on reverse side is $25.00 (V). • Gauge Only Deduct $.025 (V). • Imprint Change on reverse side is $25.00 (V). • Imprint Size: 6" x 1/2" - approximately 30 characters and spaces. 12" x 1/2" - approximately 60 characters and spaces. This natural wood ruler is a GREAT VALUE! Imprinted in red, black, green, light blue, dark green, light green, purple, teal, or maroon. Random color imprint if not specified. and KELLY GREEN. Shipped in assorted or single colors. Ad message—BLACK. OR FLUORESCENT PINK. Shipped in assorted or single colors. Ad message—BLACK.